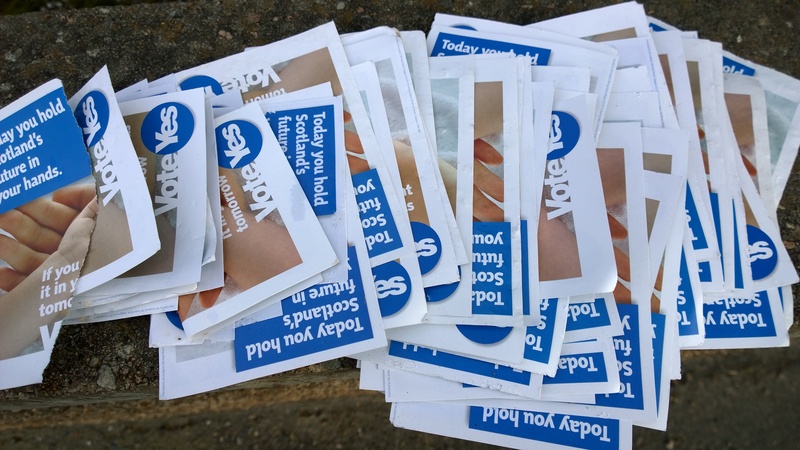 I was very saddened, the day after referendum voting, to come across about fifty “Yes” leaflets someone chucked all over the pavement, littering our bonny nation. Ironically, the SNP propaganda claimed only a vote for full-blown separation could ensure our future remained in our own hands, “forever”. To complete the effect, as you can see below, a young baby adorned the missive. Of course, Scotland voted “nay” – or “wait and see”, as one “Yes” supporter aptly described the outcome to me. However, does this mean that we are now disenfranchised citizens and neutered activists for the common good? Absolutely not! The battle goes on on so many different fronts and the people of Scotland are being called to get stuck in. Whether cleaning-up litter or mentoring less fortunate souls in their neighbourhoods, planting new community gardens or developing new business enterprises, we are (as always) desperately in need of citizens to step-up and take the lead. Where are the individuals who care less about safeguarding their rights and more about shouldering their responsibilities, pursue not only their own interests, but what benefits their fellow human beings? How can a campaign which claims to be about making Scotland better degenerate into flinging ugly accusations on social media, or creating more mess on our already rubbish strewn streets? Certainly, we must hold to account those politicians who promised so much and must now focus on delivering a more representative, fairer democracy for the United Kingdom (see this excellent petition for another to keep up the pressure). Nevertheless, I believe a much more comprehensive settlement is needed to sort out these issues for the foreseeable future and right the historic injustices that have evolved over the years of cobbling together different parts of these sceptred isles. This constitutional change desperately needed to improve perceptions of how democracy works in our country and demonstrate that representatives serve the people who elect them, not narrow party or self-interest. I am astounded that the likes of Ed Balls – questioned closely on Radio 4’s “Today” – could not agree that the simple principle, English matters should only be decided by English MP, is fundamentally fair. There should be no hesitation for any political party to follow the SNP’s example and adopt – as constitutional convention – a policy of not voting where a decision does not affect their constituents, such as a MP for Blackburn in West Lothian influencing what happens in Blackburn, Northern England. Clearly, this does not preclude further constitutional reform, but merely begins the process with what is possibly a temporary – but nevertheless essential – expedient. Establishing this principle would improve cross-border relations and reduce resentment towards Scottish MPs who could easily hold the balance of power in key votes that do not even concern them.  Reducing voters’ current confusion as to what falls under which jurisdiction.  Only English MPs would be gathered when there are debates and votes at Westminster on English issues, satisfying the demands of UKIP et al. Personally, I would prefer the regional “party list” MSPs to be scrapped as they add little to democracy, but I could envisage a situation where they are integrated into the process, to add extra depth to the Scottish parliament. This path to real change would be difficult for our politicians, who must make considerable sacrifices and see some of their own jobs disappearing, but this is exactly the process seen in our health, education and police services. For example, the BBC (since 2009) has reduced the senior manager bill by 35% (from £78.5m to £51.1m). Surely, they represent what is possible and what our representatives must aspire towards? 1) We can share in the successes of Team GB in London 2012 (and again at Rio 2016), as well as remembering the extraordinary sacrifices of men from both sides of the Border who fought shoulder-to-shoulder against tyranny in two world wars and mourned the passing of comrades, whether hailing from Edinburgh or Essex. Many of us cheered and enjoyed the sight of seeing our closest kith and kin, England, top of the Commonwealth medal board, heartened also by Scotland’s outstanding performances. 3) Then, there are the tens of millions frittered away on campaigning. The cost of white papers, studies, leaflets, billboards, offices, pollsters, airwaves, staff… £13.3 million on running the referendum, £5.2 million for “Better Together” and £4.5 million for “Yes Scotland”. That doesn’t include funds that Labour or the Conservatives have spent contesting the referendum (estimated £2.75m based on pre-agreed limits), or the policing required (i.e. investigations into death threats and online abuse, as well as presence at campaign rallies). In terms of the other campaign groups, Business for Scotland were found to have been given £199,120, Christians for Independence £100,000, No Borders Campaign £75,000 and Mr. Angus MacDonald, £25,000. In total, at the very least, that’s £26.15 million. 4) If the SNP really believed in social justice, they would have spent every penny on alleviating poverty, improving training opportunities and creating work projects for the jobless. If the SNP truly wanted a better, more beautiful Scotland, every volunteered second they wasted manning stalls or shoving junk mail through doors they could have spent picking-up litter, weeding flowerbeds or cleaning-up derelict land. Instead of time, effort and intellect wasted on to trying to out-argue the opposing side, all this could be better spent developing improved public services and a fairer society. How many hours, how much money have been frittered away chasing castles in the sky? We’ve endured seven years of SNP rule and Scotland is still the worst-performing Western European country with regards to health and wealth, the poorest and the sickest. In fact, a leaked report claims that Salmond is planning £450 million of NHS spending cuts following the referendum! I’m not endorsing the status quo. Bring on a federal United Kingdom where Scottish, English, Welsh and Irish people all have more influence over the issues that affect them. However, let’s keep the family together and work out our differences peacefully, rather than being ripped apart by a once-forever, messy divorce. Why are specialist cars not designed to give their drivers a good night’s sleep? There’s plenty of space inside a standard automobile, but someone needs to customise the interior so the standard driving pose of those two front seats can be transformed into comfortable sleeping beds. Think about how much space is wasted in most cars because of the gear stick (when automatic is so much easier) or handbrake (which could just be a button). Then there’s the steering wheel. Imagine a miniaturised version that folds out of the way to make more space for your legs to stretch out. As for those huge dials and guages for speed, petrol and revs… they could easily become digital chrono, showing only the relevant information and taking up a fraction of the space. The chairs could all be lowered at the press of another button and recline backwards so there is uninterrupted sleep space from just under where the steering wheel was located to the boot of a car. The back seats would be on rollers so they can move further back to create a continuous mattress that is at least 6 feet 5 inches. Next, grab a pillow, wriggle into a sleeping bag and a cosy bed has been conjured-up out of what was once was seen as just a mode of transport from A to B. Enjoy the benefits of being able to park anywhere on the planet, without worrying about shelling out for a B&B or hotel. Wake-up in the morning refreshed, find the nearest diner (or McDonalds) and then continue with the journey, whether a long distance business trip or holiday tour.